It's been two years since Miri was sent to the Princess Academy in Mount Eskel. Two years since her best friend Britta was chosen to marry the prince and left for the capital city, Asland, and two years since Miri helped her community to be rightfully paid for the linder stone they mine. Now Miri and the other academy girls have been invited to the capital. Miri is excited for the chance to study at the Queen's Castle university, but while there Miri learns that things are not always black and white, and when revolution begins to brew, Miri struggles to figure out what she believes. I had not read the first Princess Academy book, which was a Newbery honor book. I know it's always been very popular with the middle school girls at my school, as have almost all of Shannon Hale's books. I didn't find it an issue reading this one without reading the first. Certainly if you've read the first one, you'll have all the background and won't be confused by what "linder speak" is and so on. Everything gets explained, so it isn't a must, but this is definitely a sequel and not a companion. I really enjoyed it. Miri was a complex and thought provoking character. Her struggles are what most girls are going to go through: trying to figure out who you are exactly apart from your family, and what are the things that are important to you. Miri is a very smart girl. Before the academy, the people of Mount Eskel were uneducated. After Miri learned to read, she figured out that her community was not paid fairly for the mining they did, and she helped to change that. Miri wants to learn more so that she can return to Mount Eskel and make sure that everyone is educated. Of course, once she gets outside her small community, Miri is blown away by all that's out there. All the knowledge that's out there. She begins to wonder if Mount Eskel is the right place for her after all. Miri also learns that there isn't always a clear right and wrong. There are whisperings of revolution against the royal family and the king in particular who takes tributes so high people are starving. Miri agrees that the king is wrong, and worries what will happen to Mount Eskel when they are asked for tributes. She knows the people have only just begun to pull themselves out of poverty and paying a tribute would destitute them. However, Britta, her best friend, will be a royal soon, and Miri is friends with the prince. She doesn't believe the royals are evil. I thought Shannon Hale did an excellent job portraying the many different sides to a political situation, and how there is no clear "good" or "evil." People may be willing to go to extremes for their cause, and if some people are hurt along the way it's all in the name of the greater good. Miri muddles her way through, thinking she's making the right decisions and swept up in creating change, and then suddenly realizing that perhaps she's hasn't been looking at the full picture. I also liked that we got to see the power of education. Those that are educated hold the power. Without it, people are helpless. But people can also use their education to manipulate others. In some situations, Miri thinks, "Well she's so smart, surely she must be right." Information literacy! Smart people don't know everything about everything! You have to do the research for yourself! So I thoroughly enjoyed this and highly recommend it. And I think there's a possibility of more books about Miri, and I would be happy to read them. 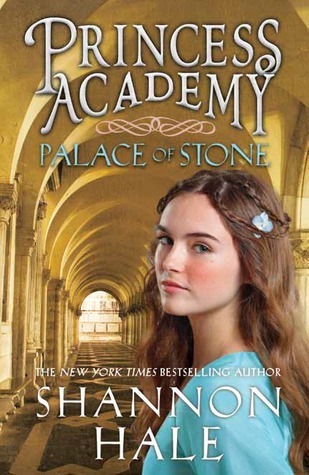 Princess Academy: Palace of Stone comes out August 21, 2012.